Nothing truly groundbreaking today, but I had a good breakfast and here’s my not-so special-recipe to start the day gluten-free and dairy-free. If you’re in a hurry, but you still want to munch on something healthy this pancake recipe could be what you’re looking for. I mixed a quarter cup of gluten-free cake flour with enough water and a drop or two of coconut oil to create a thick batter. I oiled a pan with a minimum amount of coconut oil, probably a quarter teaspoon, and turned on the stove on the lowest setting. Then, I poured the pancake batter in the warm pan and let cook each side until golden. Meanwhile , I prepared my first espresso of the day and warmed half cup of almond milk for 20 seconds in the microwave (almond milk tends to overheat easily.) Poured some maple syrup on my pancake and slowly enjoyed my cup of fake cappuccino. Again, nothing earth-shattering, but made me feel better about my breakfast. Photo manipulating the picture with the usual Paint.NET was an added bonus. 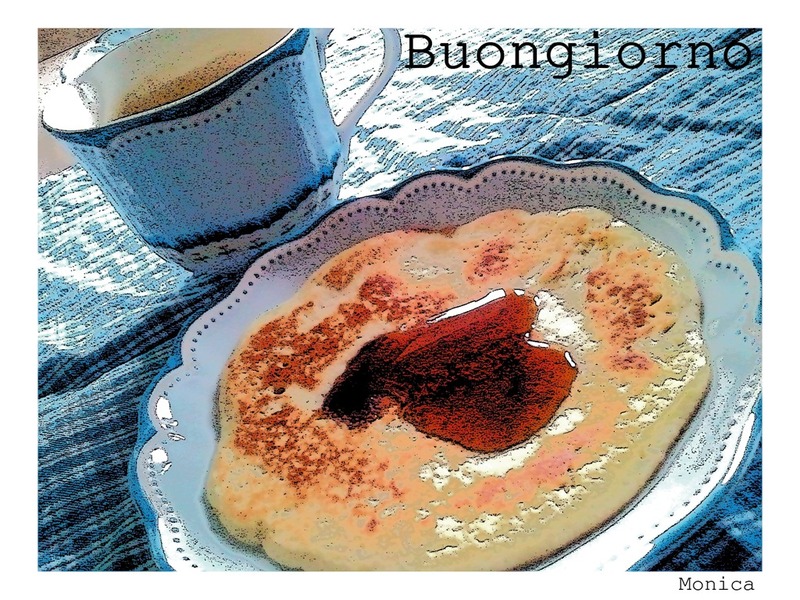 Buona giornata!